Aimée Schinasi is a licensed acupuncturist. She is a graduate of the Oregon College of Oriental Medicine in Portland, Oregon. Community acupuncture is a business model for acupuncture clinics that wish to provide affordable acupuncture. 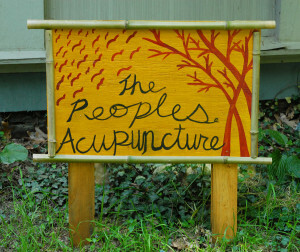 The People’s Acupuncture of Asheville is a proud member of the Peoples Organization of Community Acupuncture (POCA), which is an organization networking community acupuncture clinics around the world. We believe community acupuncture is a revolutionary way of providing health care and making it accessible to anyone in need. We are committed to our patients and to expanding the field of acupuncture. In our waiting room you will find a map of POCA clinics across the US and some of their business cards. You can also locate other POCA clinics by going to the POCA website www.pocacoop.com and searching under locate a clinic.